This large, shaggy brown animal known as the American Bison in Riding Mountain National Park in Manitoba, Canada fears nothing except for humans or wolves and grizzly bears when the bison is still a calf. 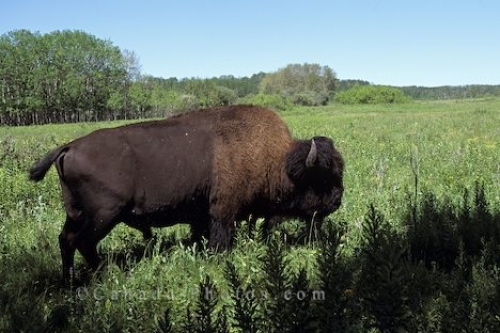 An American Bison can seem so peaceful grazing in the fields but may turn and attack at anytime. They are extremely swift animals and cover a tremendous amount of ground due to their wide gallop and can easily be clocked at up to thirty-five miles per hour. American Bison, Bison bison (Linnaeus) Riding Mountain National Park, Manitoba, Canada, North America. Picture of an American Bison roaming throughout the lush green fields in Riding Mountain National Park in Manitoba, Canada.